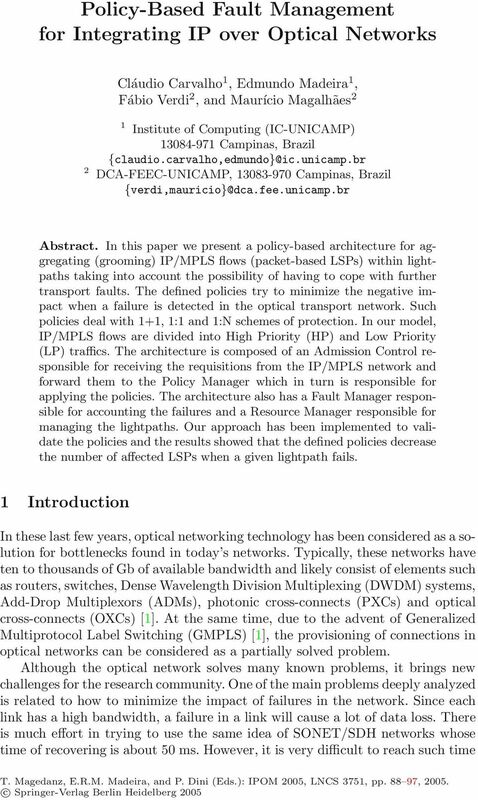 Download "Policy-Based Fault Management for Integrating IP over Optical Networks"
7 94 Cláudio Carvalho et al. physical network, 36 lightpaths (36 Gb/s) from node 2 to node 6 could be created. The quantity of unprotected lightpaths is 4, 1:N is 6, 1:1 is 2 and 1+1 is also 2. For the 1:N scheme of protection we defined 1:3 what means that there are 3 primary lightpaths being protected by 1 backup. This results in 6 groups of 1:3 (6*(1+3)=24). In case of 1:1 and 1+1, for each primary lightpath there is one backup. Thus, since there are two 1:1 and two 1+1 lightpaths, we have the total of 8 lightpaths in these two groups. Then, by summing 24 (1:N) + 8 (1:1 and 1+1) + 4 (unprotected) we have 36 lightpaths. We have created 8 different traffic loads to validate the policies. From 80% (0.8) to 240% (2.4) of the network bandwidth (36 Gb/s). With these different loads we were able to test the behavior of the policies in scenarios that the quantity of generated traffic is lower than the capacity of the network and to the other extreme, we stressed the network with a high load. The percentage of generated traffic for requisitions (IP/MPLS traffic) for each type of protection is as follows: 35% for unprotected, 15% for 1:N, 20% for 1+1 and 30% for 1:1. Such traffic is generated taking into account the network load percentage. As an example, for 120% (1.2) of traffic load, the quantity of generated requisitions in Gb for 1:1 is: 36 Gb (network capacity) * 1.2 (load to be generated) * 0.3 (percentage of 1:1) 13 Gb/s. The minimum bandwidth required for each requisition is 50 Mb/s and the maximum is 400 Mb/s. Statistically, the average bandwidth for each requisition is then 225 Mb/s. The simulations perform 20 iterations and then the arithmetic mean is obtained. A single fiber failure is randomly generated for each iteration. Figure 4 shows the quantity of traffic that was admitted in the optical network. Admitted LSPs / Generated LSPs Admitted LSPs G1 G2 G Network Load Percentage Fig. 4. Percentage of admitted traffic Note that the G1 is the worst group of policies (actually it is the simplest one). The G3, considered the most sophisticated group, performs better when compared with the other two groups. Observe that G3 and G2 admit basically the same quantity of flows. It is important to point out that the percentage of admission depends on how the requisitions are aggregated within each lightpath. This problem is similar to the knapsack problem . 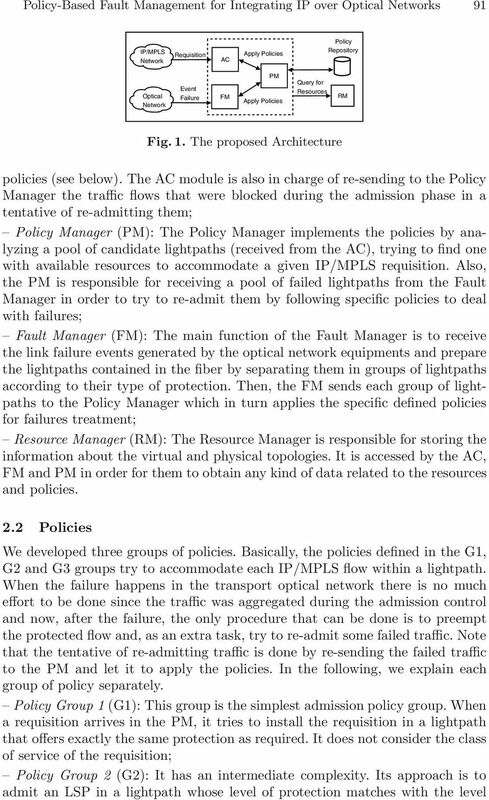 10 Policy-Based Fault Management for Integrating IP over Optical Networks 97 Policy Manager, a Resource Manager and a Policy Repository. The policies work with the idea that optical networks have a high amount of available bandwidth in each physical link. If such a link comes to fail, the quantity of data that will be lost is consequently very high. Solutions that are only based on schemes of protection such as 1+1, 1:1 and 1:N have been widely discussed. Such solutions can be improved if the type of traffic being transported within a lightpath is considered when aggregating the flows. 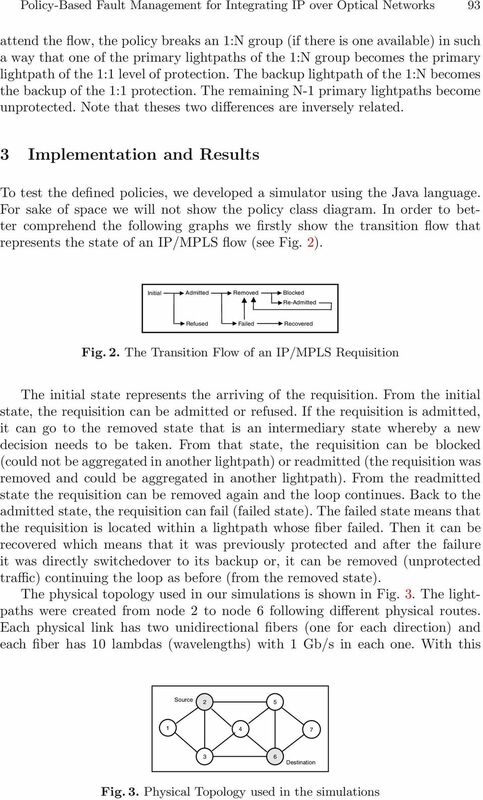 The policies defined in this paper showed that the number of IP/MPLS flows that are affected when applying the policies is smaller when compared with a scenario that does not use the policies. As further works we are interested in considering the multi-hop traffic aggregation as well as to explore novel policies for admission control. Also, an important point to be addressed is related to the end-to-end multi-domain connections and Optical VPNs. 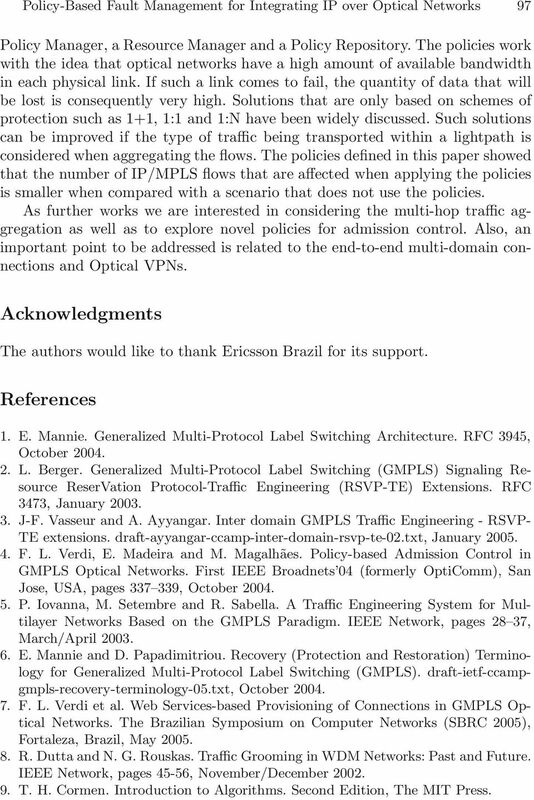 Acknowledgments The authors would like to thank Ericsson Brazil for its support. References 1. E. Mannie. Generalized Multi-Protocol Label Switching Architecture. RFC 3945, October L. Berger. 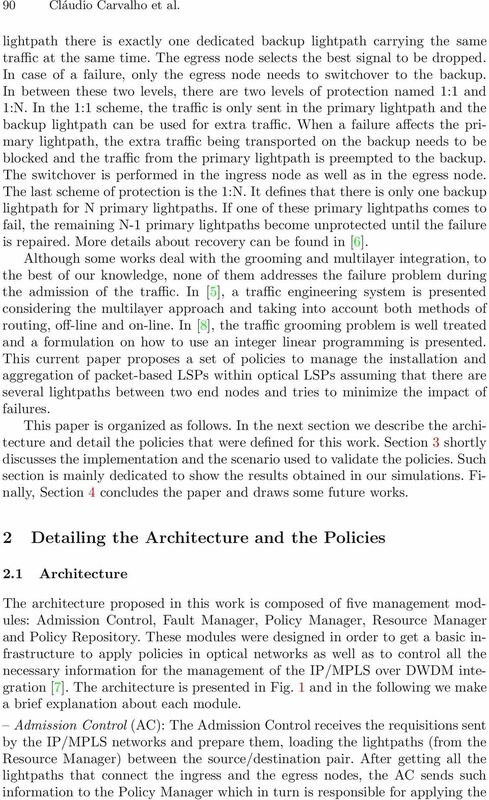 Generalized Multi-Protocol Label Switching (GMPLS) Signaling Resource ReserVation Protocol-Traffic Engineering (RSVP-TE) Extensions. RFC 3473, January J-F. Vasseur and A. Ayyangar. Inter domain GMPLS Traffic Engineering - RSVP- TE extensions. draft-ayyangar-ccamp-inter-domain-rsvp-te-02.txt, January F. L. Verdi, E. Madeira and M. Magalhães. 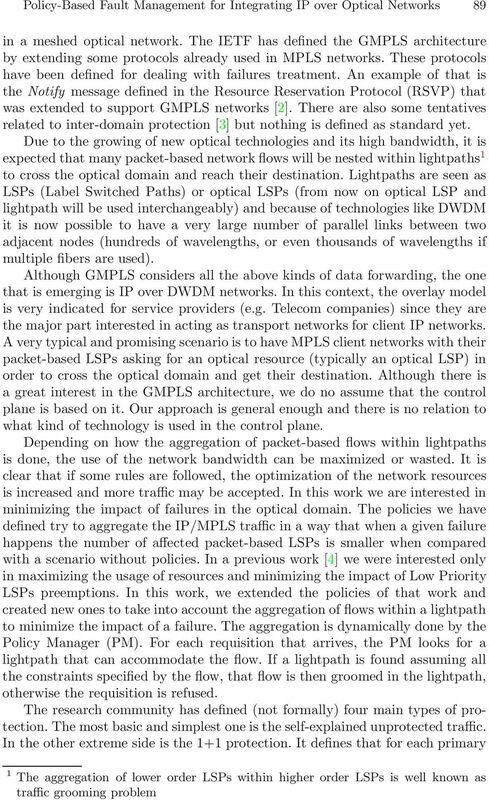 Policy-based Admission Control in GMPLS Optical Networks. First IEEE Broadnets 04 (formerly OptiComm), San Jose, USA, pages , October P. Iovanna, M. Setembre and R. Sabella. 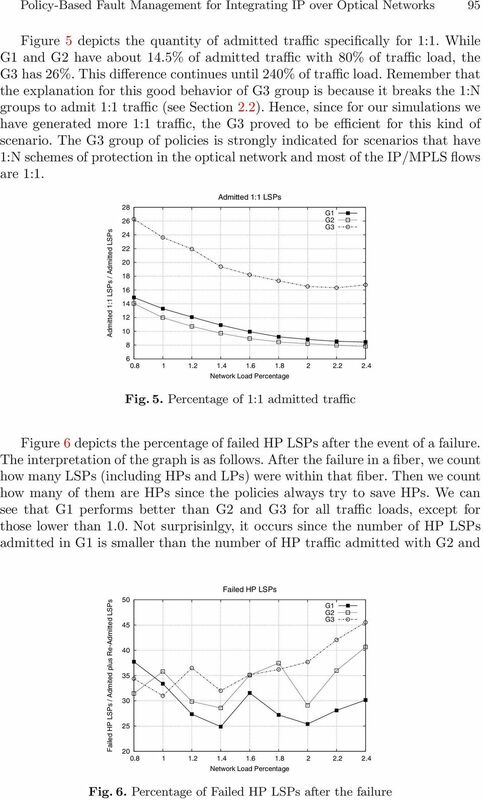 A Traffic Engineering System for Multilayer Networks Based on the GMPLS Paradigm. 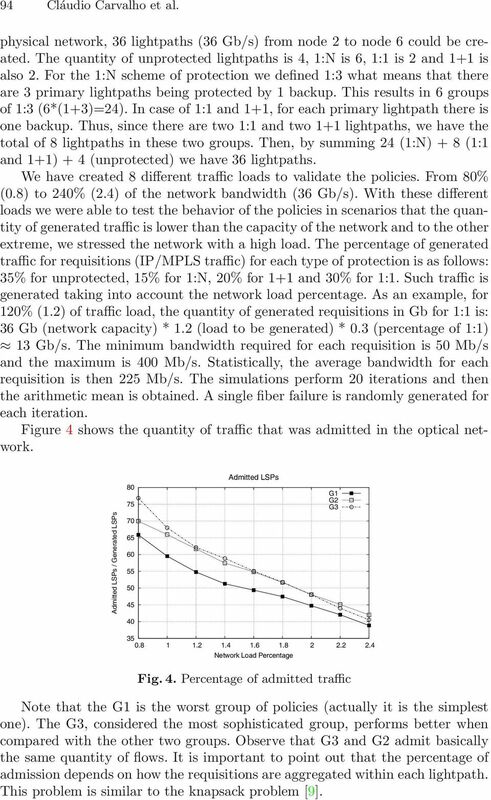 IEEE Network, pages 28 37, March/April E. Mannie and D. Papadimitriou. Recovery (Protection and Restoration) Terminology for Generalized Multi-Protocol Label Switching (GMPLS). draft-ietf-ccampgmpls-recovery-terminology-05.txt, October F. L. Verdi et al. Web Services-based Provisioning of Connections in GMPLS Optical Networks. The Brazilian Symposium on Computer Networks (SBRC 2005), Fortaleza, Brazil, May R. Dutta and N. G. Rouskas. Traffic Grooming in WDM Networks: Past and Future. IEEE Network, pages 45-56, November/December T. H. Cormen. Introduction to Algorithms. Second Edition, The MIT Press. Journal of Network and Systems Management ( c 2007) DOI: 10.1007/s10922-007-9060-2 A Service Oriented Architecture-based Approach for Interdomain Optical Network Services Fábio L. Verdi, 1,4 Maurício F.
Workshop - New Paradigms for Routing in Optical Networks Efficient routing for high capacity, flexible optical networks with different classes of service Douglas Aguiar July 2015 padtec.com Summary 1. Failures. Network Survivability. Failure Scenarios. Terminology. Classification - Protection and. Protection vs Restoration.